Azimut is preparing to launch its new flagship, Azimut 116. The first example of this 35m. motoryacht, equipped with a gliding bottom and MTU engines totalling 4,000 HP, will be launched during the summer and can be admired at the forthcoming Genova show. The exterior layout was designed by Stefano Righini and the interior by Carlo Galeazzi; they, in perfect agreement with the Azimut design office, came up with an extremely flexible design. 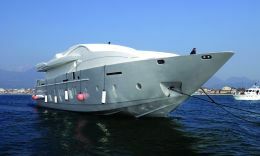 The new Azimut 116 is built around three and a half decks, brightly lit by wide elliptic windows and by numerous large vertical and oval portholes. On the outside there is the sundeck, equipped with a mast, from which two electrically openable hardtops extend towards both stern and bow. These make it possible to shade the futuristic fly bridge from the control station to the Jacuzzi tub. The fly covers the cockpit almost completely, making this a pleasant living area at all times. The shipyard has allowed great flexibility in equipping Azimut 116 and several versions are offered in order to meet the approval of any owner. The interior decoration is in bleached chestnut oak and walnut, in line with the current minimalist trend but the shipyard offers various solutions and will readily personalise in any way. Onboard plants and systems are the most modern the market has to offer. 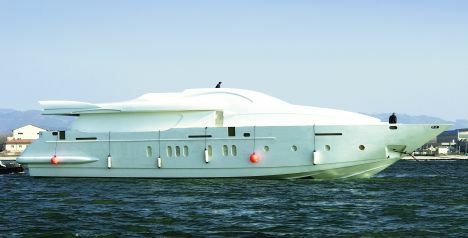 Astern, the large garage can house a tender and two jet skis, or only one jet ski, leaving space for another en-suite cabin for crew.